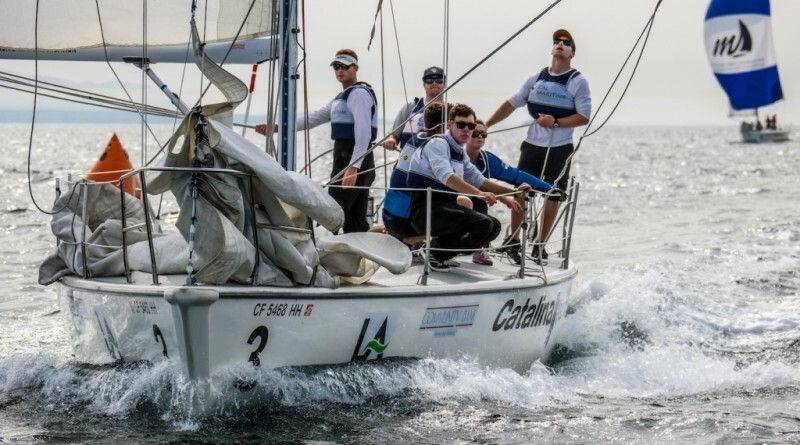 SAN PEDRO, California — Cal Maritime held off the University of South Florida in winning the 10th annual Port of Los Angeles Harbor Cup regatta, held in San Pedro March 10-12. The nautical institution in Vallejo, California logged its sixth-ever win in the regatta, most all-time. The Keelhaulers unseated College of Charleston as defending champions, comfortably defeating the Bulls by a 3-point margin after two days of challenging racing in the waters off Point Fermin. College of Charleston Cougars finished third, with 22 points. No races started on the final day due to fog. The invitational regatta annually pits ten of the top sailing teams from across the United States and – for the first time this year – Europe. Team Ireland debuted as the Port of Los Angeles Harbor Cup’s first international team and finished seventh overall. Conditions during regatta were alternately breezy, light winds, with the fleet playing cat-and-mouse with the fog, before being closed out on the final day. The Port of Los Angeles, Los Angeles Yacht Club, and the California State University Maritime Academy founded the Port of Los Angeles Harbor Cup in 2008 to encourage young men and women to enjoy the benefits of competitive offshore big boat sailing. The regatta is organized and run by the Los Angeles YC, who provide accommodations, meals, hosting and events for the visiting teams.